John was working on the building site as a lad where it was his job to take bricks to the bricklayers. In the 60’s, all the bricklayers and labourers were in what was called a ‘gang’. In John’s case, he was in a 3+1 gang - three bricklayers and John, the labourer. Most bricklayers used a hod, which held 12 bricks and went on their shoulders and which they carried up ladders all day. Instead of this, John devised a simple piece of floorboard, about 18 inches long, which he could stack 24 bricks onto. 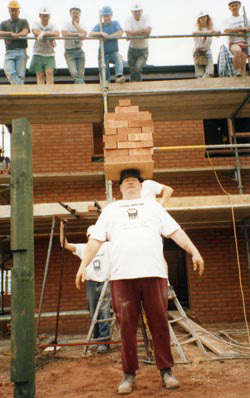 He would then lift it onto his head and balance all the bricks as he climbed up ladders - twice the amount anyone else could do! In 1981, famed strongman Geoff Capes did a show in Ripley Derbyshire, lifting 24 bricks off a table with his arms fully stretched out across his mighty chest. After seeing the show, John went home and tried to balance some bricks on his head to see if he could still do it. He managed to lift and balance 36 bricks, so he called in the media. TV and newspapers came to visit him and his new career was born. John was asked to do charity events to show off his skills and this led to him putting a show together that lasted about 30 minutes. Now, he is known worldwide and has 33 Guinness World Records and 44 Record Holders Republic World Records. John has also been made a vice president of Record Holders Republic for his input as one of the very best world record holders. In March 2007, John turned 60 years old. 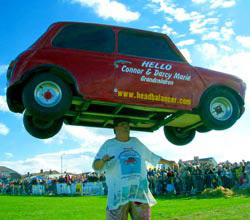 In June 2007, John broke two of his own world records, balancing 429 full cans of 7 UP on his head for 15 seconds hand free (with a weight of 27 stone) and then balancing 98 milk crates on his head for over 10 seconds.